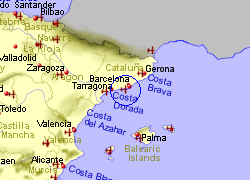 Located approximately 10km west of Sitges, and 40 Km from Barcelona, on the Costa Dorada, the coastal town of Cubelles (Cubellas in Catalan) is the most southerly resort in Barcelona provence (an area known also as the Costa Garraf). The resort has a castle built in 1675 on the site of a 10th century castle. The town has a long palm tree lined promenade with a fine sandy beach, broken into bays by man made breakwaters. The shoreline development is mostly low to medium rise apartment blocks and there is a small selection of bars and restaurants. 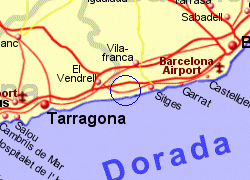 Cubelles has a station on the Tarragona to Barcelona line, the journey to Barcelona taking around 50 minutes. 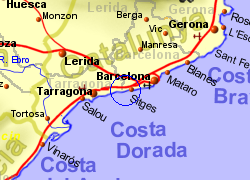 Map of the Cubelles area.